Happy birthday Kevin Henkes (Owen, Olive’s Ocean). It’s the birth date of Katherine Milhous (1894–1977), The Egg Tree. Actor/martial artist Bruce Lee (1940–1973), and musician Jimi Hendrix (1942–1970) were also born on this day. Read The Martial Arts Book by Laura Scandiffio and Jimi: Sounds Like a Rainbow by Gary Golio and illustrated by Javaka Steptoe. It’s Pins and Needles Day, to commemorate the opening of a Broadway musical in 1937. The play was produced by the International Ladies Garment Worker’s Union. Read The Bobbin Girl by Emily Arnold McCully. On November 18 for National Aviation Month, we looked at Almost Astronauts, the story of some of the astronauts who did not make it into space. To round out the month, let’s take a look at a man who actually traveled to the moon. In an autobiography of one of our most accomplished astronauts of the twentieth century, Reaching for the Moon Buzz Aldrin explains how he got his funny name. His sister called him Buzzer, rather than brother, and the family simply shortened it to Buzz. Aldrin discusses his childhood obsession with flight, which began on his first airplane ride at the age of two, and how he adored the Lone Ranger and wanted to be strong, determined, and independent like his hero. 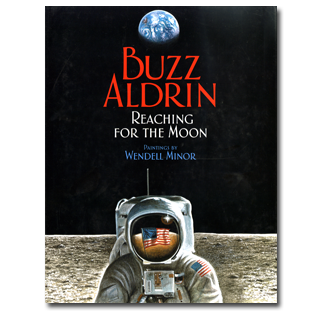 Aldrin’s understated text, for children ages six to ten, has been brilliantly illustrated by Wendell Minor. Minor captures Aldrin as a young man and shows his steps along the way to becoming an astronaut. But it’s the illustrations of the moon and space that are truly glorious; better than any photograph, they make you feel as if you are standing on the moon or traveling through space yourself. Together the text and art bring Aldrin’s personal story to life—one that can inspire and challenge young readers. 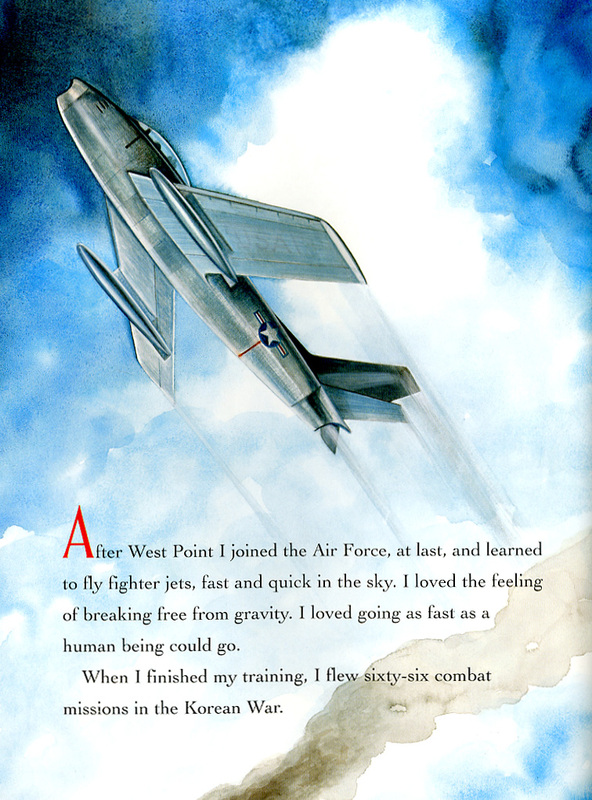 So if you have a budding pilot in your life, or you just want an autobiography that will inspire young readers, pick up Reaching for the Moon. It—almost—makes me long to travel on a space ship. Originally posted November 27, 2010. Updated for . My apologies Anita, this is the first review that I will not read on the Book A Day Almanac. I just took one glance on the book cover, on the sample page… and that is it for me. The book is on our list. Pure Beauty. With a capital B.
I promise, after we read it for the first time, I will come back to read this review. I simply know your review must be great too! PS We already have Moonshot (tomorrow’s book) – it is fab, fab, fabulous too! I’ve seen this book on the shelf but not read it. Now, I want to read it. I understand the thinking of Aldrin. I met Lovell and a few of the other guys. I was just a child when the space program started and a very young man when Armstrong and Aldrin went to the moon. I decided early on that I wanted to fly, after being allowed in the cockpit of an AA plane in flight when I was about six. I also decided I would someday go into space, and I still have that goal to accomplish. There is no way to explain what happens to you when you are in control of an airplane, do the take-off and land it yourself. No matter who you are, it changes you forever. ReadAloudDad: I’m glad to hear that a cover, an excerpt, and recommendation on BADA is all you need to purchase this book. The book is much more important to read than anything I write! Reading back my comment, I’m afraid I may have not explained myself well. Your review is equally important to me, but for the first time I wanted to test what it would be like to read a new book that you recommend first and … then read your review! Time to play around with Book A Day Almanac. Promises to be fun too! Dear Anita, Thanks for sharing again. Having worked with Buzz Aldrin on “Reaching for the Moon” was a childhood dream come true. To meet a man who walked on the moon is extraordinary, but to work with him and become his friend is something very special! Buzz Aldrin is living history, and at age 83, is still our country’s most articulate spokesman for space exploration. His message to the next generation is so important: “Not everyone can explore space. But we all have our own moon to reach for. If you set your sights high, you may accomplish more than you ever dreamed was possible…” This is a great message for any child!